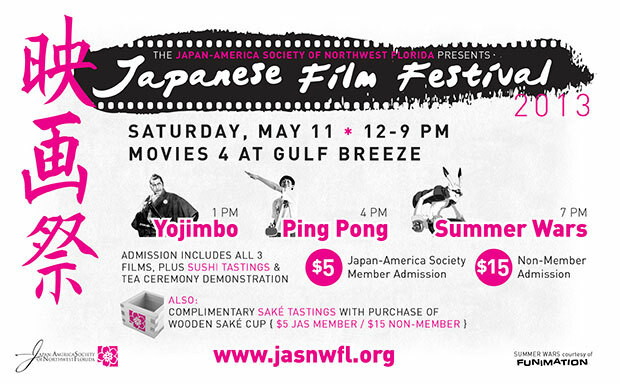 The Japan-America Society of Northwest Florida will present a Japanese Film Festival on May 11 from noon to 9pm at the Movies 4 theater in Gulf Breeze. The three movies to be screened at this inaugural event are Yojimbo, Ping Pong and Summer Wars. There will also be food and drink tastings, short video segments about Japan’s recovery since last year’s earthquake, and a demonstration of the traditional Japanese tea ceremony by Kazuko Law. Yojimbo, directed by Akira Kurosawa and starring Toshiro Mifune, is a classic 1961 jidaigeki (or period drama) about a wandering samurai (Mifune) who finds himself embroiled in a gang war and offers his services to both rival factions. The movie was the inspiration for Sergio Leone’s A Fistful of Dollars and Clint Eastwood’s “Man with No Name” character, and it continues to be an inspiration to Hollywood filmmakers. This screening will begin at 1pm. Ping Pong, Fumihiko Sori’s 2002 live-action adaptation of a popular manga by Taiyo Matsumoto, follows the friendship and rivalry of two high school students who compete on their school’s table tennis team against a variety of memorable characters from other academies. The movie deftly blends humor with sentiment, and features thrilling, energetic competition sequences. This screening will begin at 4pm. In 2009’s Summer Wars, writer-director Mamoru Hosoda imagines a world where nearly every aspect of people’s lives are linked to a giant social network called Oz. When part-time Oz employee Kenji visits a classmate’s family in the country, he is implicated in a cyber hacking scheme that could have dire global consequences. The film was awarded the Japan Academy’s Animation of the Year Prize in 2010 thanks to its stunning depiction of the Oz virtual world. This screening will begin at 7pm. Admission to the film festival is $15 per person, or $5 for Japan-America Society members. Between each movie, guests will be invited to enjoy sushi and other foods in the theater lobby. Special wooden saké cups, called masu, will also be available for $15, or $5 for JAS members. Guests who purchase cups (and are at least 21 years old) may sample saké from the renowned Tenryou brewery in Gero, Pensacola’s Japanese sister city. The Movies 4 theater is located at 1175 Gulf Breeze Parkway in the Live Oak Village shopping center. Space is limited, so guests are encouraged to RSVP in advance. RSVP by email or on the festival’s Facebook event page.